Pre-Islamic Arabia (most of what is now today Saudi-Arabia) was occupied by dessert nomads who worshiped many different gods, sometimes shared between tribes and sometimes not. With the empires of Sumer, Babylon, Assyria and Persia most of the Middle East had been home to history’s most massive empires, but the Arabian peninsula lagged behind. The nomadic tribes had long been used to assist in trade across Arabia by many empires (including the Egyptians) but the Arabians were to have their day thousands of years later with the coming of the Prophet Mohamed (570 CE – 632 CE). With his centralizing monotheism (remember how we have seen polytheism gathered up with many tribes to become empires before) Mohamed turned Arabia into the center of the most powerful and extensive empire that history had yet seen, only to be topped one thousand years later by another band of post-polytheistic back-water tribes people (Western Europeans). Mohamed (also spelled Muhammad) is seen by Muslims as the final prophet in the Abrahamic tradition (the tradition of Judaism and Christianity that we have been studying the last two weeks). Accepting the Torah/Old Testament tradition to be the lineage of the true faith, Muslims believe that Mohamed was given the Quran by God to restore the true religion of the Jews and Christians. As we saw in Judaism and Christianity, the Torah contains many prophets who tell the Jews that they are wandering into bad behavior and heresy. Muslims believe that Christians were mislead by political leaders who wanted to turn Jesus into more than a prophet, and so they believe that the Christian New Testament to be flawed with unintended additions. Muslims were the first to read the Torah/Old Testament critically (using algebra as an aid, the first analytic textual criticism), looking for the truth amidst the human error and additions. Next to Mohamed, Jesus is the next most revered prophet, and patron saint of scholarship (see your reading on Muslim stories of Jesus, one of my favorite ‘blow your mind’ books on Islam). 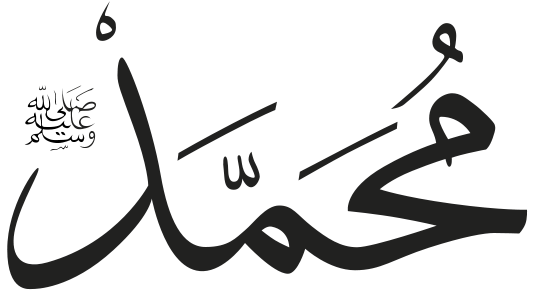 According to the teachings of Islam, Mohamed began at age 40 to receive the oral recitation of the Quran from God via the Angel Gabriel (in Arabic, Jibril). While it remains popular to memorize the Quran as an oral tradition, it was written down in Mohamed’s lifetime, thus becoming Islam’s central text. He began to preach to the people of Mecca, an Arabian city and wealthy center of international trade, imploring them to renounce polytheism and pray to only one god. This was not only identified with the Abrahamic god, but also with the singular god of Zoroastrianism, two strains which we have already seen cross paths. Mohamed gathered many followers, but failed to convert the city and was persecuted by the polytheistic rulers of Mecca. He moved with his followers to Medina, fighting wars with the Meccan rulers, and then returned to conquer Mecca and convert it to Islam. While this did drive out polytheistic worship, Jews and Christians were by law given freedom to practice their Abrahamic traditions, as were Zoroastrians. 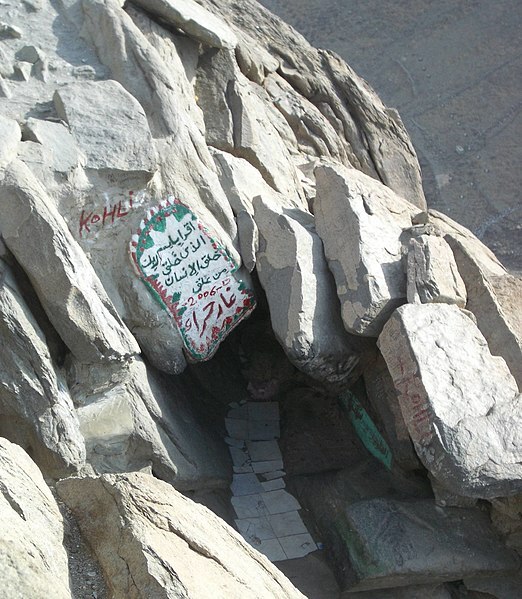 Once they had Mecca, they quickly conquered the rest of Arabia by the end of Mohamed’s life (632 CE). After Mohamed’s death, the religion spread from Spain to China, though it broke into several factions and empires in the process. 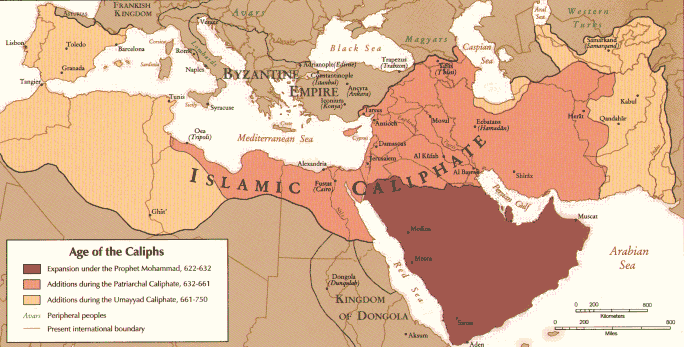 The Golden Age of Islam (700 to 1300 CE) was one of the most prosperous times in human history (see your reading on the Golden Age for more here). Europeans were to flourish in a very similar way several hundred years later, with Europeans clearly overtaking the Muslims in the late 1600s to become the richest set of peoples in the world, controlling trade and technology the way the Muslims had done. Turning to the practice of Islam, the central and essential practices are summed up by the Five Pillars of Islam. First, the Shahadah, the declared creed that there is one God and Mohamed is a prophet of God. To convert to Islam, one declares this with honest intentions and clear speech. Second, the Salah, ritual prayer five times a day facing Mecca. The prayers often consist in recitation of passages from the Quran in Arabic. The prayer times are called in Islamic lands from minaret towers by the singing ‘call to prayer’. The European practice of calling worshipers to Church with bells in towers, and clock towers that chime the times of day, have an ancestor in this Islamic religious practice. Third, Sawn, fasting during the month of Ramadan. From dawn to dusk one must have no food or drink and reflect on one’s sins. I have a friend who says that PE days in grade school (in LA) were horrible during Ramadan, especially when they had to run laps. Fourth, Zakat, giving a portion of one’s salary (provided that one can afford it) as alms to be distributed to the poor and used for charities by religious authorities. Islamic civilizations in the Golden Age often had public libraries and hospitals that were funded by the city-wide collection of Zakat. Fifth, Hajj, a pilgrimage (religious journey) to Mecca at least once in a lifetime for every Muslim who is not prohibited by health or poverty. This pilgrimage involves several ritual acts, the final one being the circling and touching of the Kaaba, the black square building which was once home to the honored gods of Mecca until Mohamed cleared out the statues to make it an early and central monotheistic shrine. 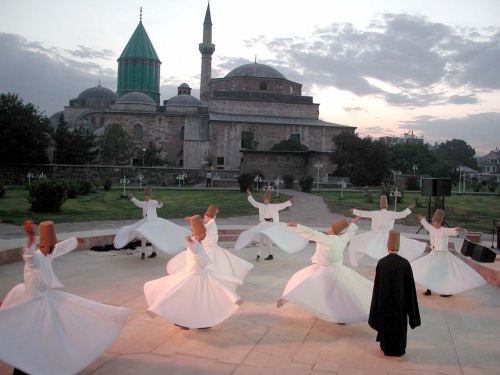 The Sufi are Islamic mystics who believe in experiencing the presence of God in this life, very similar to Christian mystics who strive to obtain the mind of Jesus and also similar to Buddhist Mahayana monks (Afghanistan used to be a center of Mahayana Buddhism). Scholars have shown that rosary beads, beads used in Catholicism to count prayers, come from Buddhist monks, to Sufi mystics, to Catholic monasteries. Sufi thought is beautiful and complex, similar in some parts to Kabbalah (Jewish mysticism) and other parts to more Buddhist insights into consciousness and selfhood. A beautiful idea that can be found in early Sufism is that Islam is in fact the religion of religion, such that all people are already Muslims but only the true Muslim (the mystic Sufi) recognizes this. This is similar to ‘everyone is Christ’ for obtaining the mind of Christ in Christian mysticism, and ‘you are already a Buddha but don’t realize it’ in Mahayana Buddhism.